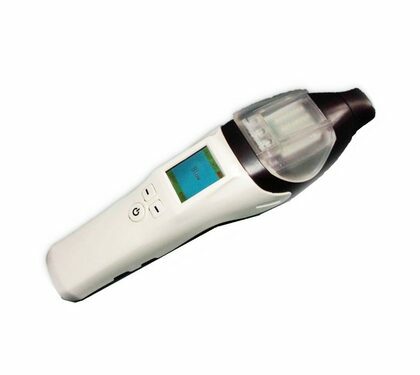 AT8700 Shark is the latest development of portable Quick inspection alcohol tester. This instrument adopts new Hi-tech Fuel-cell Sensor as its core component which can inspect accurately breath alcohol concentration with strong ability of anti-interface. AT8700 Shark has a compact keyboard, an operation menu and an admirable human-device interface which makes operation more concise and convenient. The color LCD makes interface more clear and beautiful. High light alarm lamp and headlamp are also very conveniently for operator. Non-contact fish-mouth type air blowing opening ensures the health and safety of users. This instrument are suitable for testing alcohol before work or drive in order to avoid accidents, guarantee the security of human life. Its delicate appearance and comfortable handle feel will be your best choice of an alcohol test. AT8700 Shark for QUICK screening test - 1 second!